All of that sounds like criticism, but it isn’t. 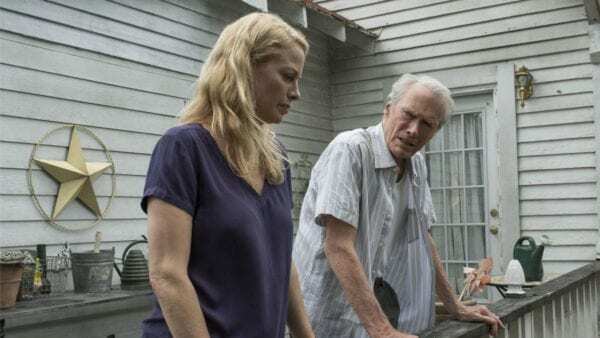 The Mule is the latest in a line of very pleasant and charming movies that act as victory laps for their leading performers. This film isn’t as achingly melancholy as Harry Dean Stanton’s posthumously released Lucky or as delightfully twinkly as Robert Redford’s The Old Man and the Gun, but it’s a fitting reminder of Eastwood’s unique brand of movie star charisma. If this is his moment to bow out and step permanently behind the camera, it’s a worthy farewell. His protagonist, Earl Stone, is a strange beast – a Korean war vet who is mumbling amiably along to country music in his truck one minute and dancing provocatively with women a quarter of his age the next. We meet him in the early noughties as he wanders around a flower convention, pausing pointedly to look at a stall for a new online flower business. When the story flashes forward to 2017, he’s mumbling about how the “damn internet ruins everything” while driving belongings away from his home, daubed with foreclosure notices. The message is clear – modernity is bad and Eastwood’s ilk of straight-talking military types are good. In true fashion for that character archetype, Earl is the opposite of a family man. The rigours of the horticulture business – I know, me neither! – have meant that Earl is basically estranged from his ex-wife (Dianne Wiest), daughter (Eastwood’s real child Alison) and granddaughter (Taissa Farmiga). It’s humiliation at a social occasion that drives Earl into the arms of a drug cartel, who are keen to use him as a mule thanks to his clean criminal record. He’s so clean-cut in fact that he’s never had a parking ticket or speeding fine, and even drives with his hands at ten and two on the steering wheel. Soon, he has a boot full of cocaine and a glove compartment full of cash. 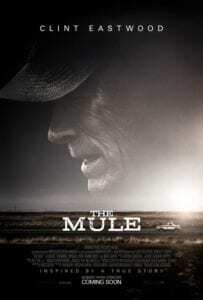 It’s fair to say that The Mule is going for genteel charm rather than high-octane criminal thrills. 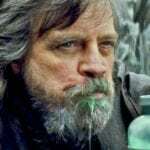 The crime side of the narrative is handled by Bradley Cooper as a newbie DEA agent urged by boss Laurence Fishburne to make “a big splash” with some lucrative busts. Cooper’s quippy cop, along with Michael Pena as his equally snappy partner, provides many of the film’s comic highlights as he deals with a preening cartel underling who’s pressured into turning snitch. 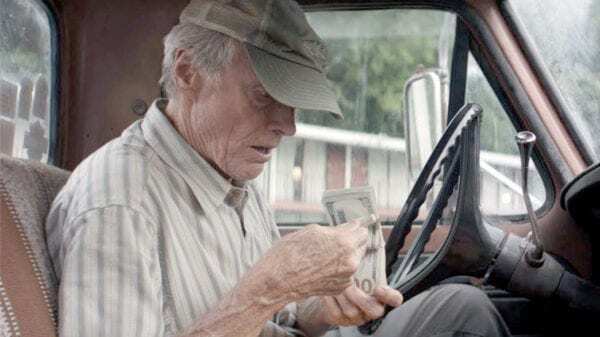 The film is wise enough to hold these scenes at arm’s length in order that they never detract from the fact this is a showcase for Eastwood at his most magnetic. But often, Eastwood’s old-fashioned sensibilities get in the way somewhat. There are dozens of side gags about the youth of today and their shortcomings, while an entire scene at a service station seems to have been grafted in solely because someone thought the very non-PC pun “dykes on bikes” was hilarious. The nadir of this comes in a pool party sequence so leery and uncomfortable that even Michael Bay might suggest taking out a couple of the gratuitous arse shots. But when he isn’t being overtly sexist, Eastwood’s character is able to sell these moments with a sense of self-deprecating fun and knowing ridiculousness. When a cartel employee suggests they communicate via “texts”, he barks the word back as if he’s just asked him to recite the alphabet in Klingon. There’s something about The Mule‘s gently avuncular charm that makes it work, even as it falls over and over into cliché. A third act emotional scene involving Earl and his former spouse is played far too broadly to ever land a serious blow on the audience and Andy Garcia never quite rings true as a cartel boss so cartoonishly wealthy he shoots clay pigeons with a gold-plated rifle. This isn’t a film that’s big on subtlety or politics, but it does serve as a big screen curtain call for an actor with real presence. 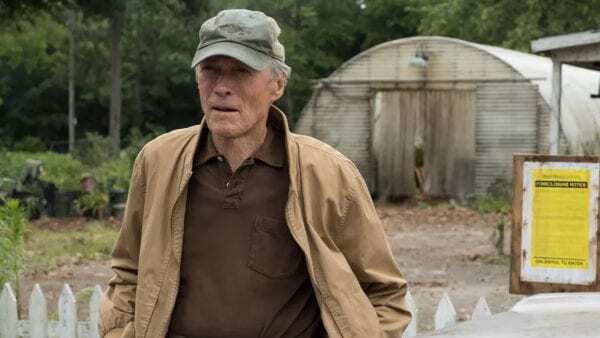 Eastwood is one of the last great movie stars and, with The Mule, he gives everyone another example of his ability to lift material on his curmudgeonly shoulders.